Before the Caribbean-inflected spoken-word poetry of the 1990s, epitomized by poetry slams at the Nuyorican Poets Café in Manhattan, there was reggae. In the past thirty years, most Caribbean poetry written in English has come to the shores of the United States on waves of music, in the lyrics of Bob Marley, Peter Tosh, and Burning Spear. Kwame Dawes, himself a musician and poet, is not surprised by this phenomenon. The region's political and cultural awakening of the 1970s was fueled by a growing African consciousness, often in competition with the multiple traditions--European, Indian, Chinese--that have permeated many Caribbean nations for centuries. The influence of reggae has produced a poetry that is quite different from earlier work from the Caribbean, but this is only one more chapter in a tradition characterized by continuing tension with a diverse heritage. 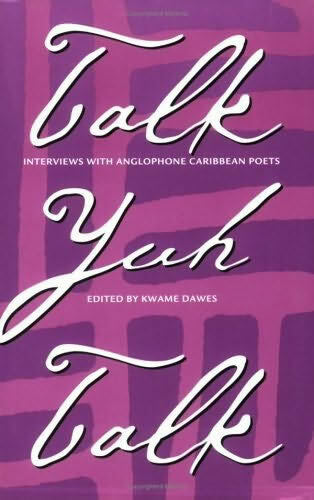 The interviews in Talk Yuh Talk reflect a range of Caribbean voices from several generations, from those poets influenced by a dynamic interplay between the popular culture of reggae, calypso, folk music, and "yard" theater to those whose work is closer to classical forms of literature and oral narrative. Kwame Dawes talks with many of the most important poets to have emerged from the Caribbean who are still writing today. The poets discuss their techniques, their situations as poets, and the challenges they face in the profession and in their craft. Well-known figures like Lorna Goodison, Grace Nichols, Kamau Brathwaite, Fred D'Aguiar, and Martin Carter share space with such lesser-known but equally important poets as Mervyn Morris and Kendel Hippolyte.